Beau Biden, Vice President Joe Biden's Son, Dies After Cancer Battle : The Two-Way Biden's older son has died after battling brain cancer, the vice president said Saturday. Beau Biden, a former attorney general of Delaware, was 46. He was running next year to be Delaware's governor. 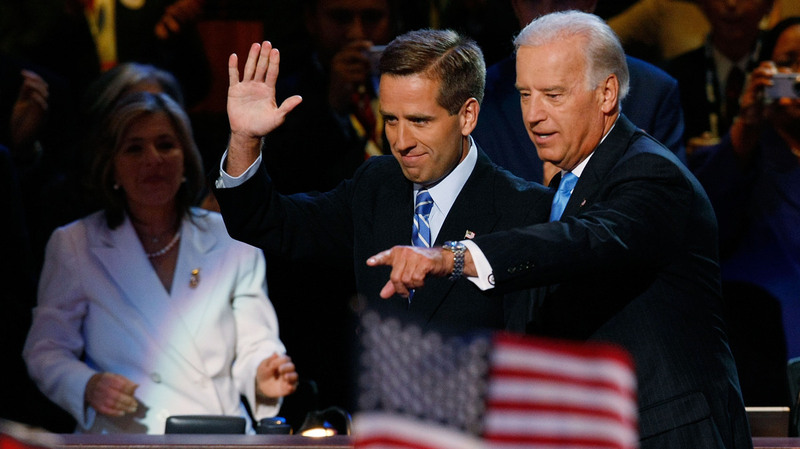 Beau Biden and his father, Joe Biden, at the 2008 Democratic National Convention in Denver. Beau Biden, Vice President Joe Biden's older son, has died after battling brain cancer, the vice president announced Saturday. Beau Biden, a former attorney general of Delaware, was 46. "It is with broken hearts that Hallie, Hunter, Ashley, Jill and I announce the passing of our husband, brother and son, Beau, after he battled brain cancer with the same integrity, courage and strength he demonstrated every day of his life," Joe Biden said in a statement issued by the White House. Hallie Biden is Beau Biden's wife; Hunter and Ashley are his brother and half-sister. Beau Biden was being treated at Walter Reed Medical Center in Bethesda, Md., the vice president's office said earlier this month. He had announced he would be running next year to be Delaware's governor. He was a major in the Delaware National Guard, and served a yearlong tour in Iraq. In 2010, Beau Biden suffered a mild stroke. Three years later, he underwent surgery after being diagnosed with a brain lesion. "The entire Biden family is saddened beyond words. We know that Beau's spirit will live on in all of us — especially through his brave wife, Hallie, and two remarkable children, Natalie and Hunter," Joe Biden's statement said. In a separate statement, President Obama said, "Beau took after Joe. He studied the law, like his dad, even choosing the same law school. He chased a life of public service, like his dad, serving in Iraq and as Delaware's Attorney General. Like his dad, Beau was a good, big-hearted, devoutly Catholic and deeply faithful man, who made a difference in the lives of all he touched — and he lives on in their hearts." In 1972, a car accident killed Joe Biden's first wife, Neilia, and infant daughter, Naomi. Beau and Hunter Biden, 4 and 3 at the time, were injured in the crash. For five years, before he married his second wife, Jill, Joe Biden raised the boys as a single father. At the time of that fatal accident, Joe Biden was newly elected to the U.S. Senate. He was sworn in at the hospital, at his sons' bedside, and began to commute daily from D.C. to Delaware to spend more time with his children.